Quick Unruly was adopted the day after the picnic by Kelli and Ben in Florence, KY. They adopted Lola in December and when Kelli saw Quick Unruly at the GAGC Family Picnic yesterday she fell in love and wanted Ben and little dog, Ellie to meet him. Well the meeting went very well and DUKE is now home. 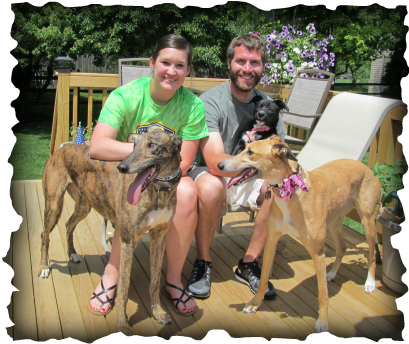 Lola is thrilled to have another greyhound in the family!